Patchy the Pirate – From SpongePedia, the biggest SpongeBob-wiki in the world! This page may require cleanup to meet SpongePedia's quality standards. Please feel free to improve this article if you can or suggest a change here. Patchy the Pirate is the president of the SpongeBob SquarePants Fan Club and he is also SpongeBob’s number one fan. 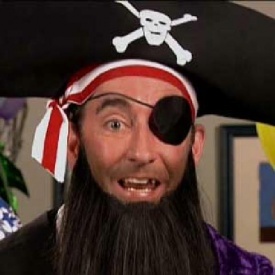 Unlike most SpongeBob characters, Patchy is human, and is played by Tom Kenny. Patchy lives in an unnamed suburb in Encino, California with his pet parrot, Potty. Patchy is mostly featured during special episodes, such as The Sponge Who Could Fly and Christmas Who?. He really loves SpongeBob and was furious when he thought the lost episode of SpongeBob was nothing but SpongeBob going through "a bunch of cheap walk cycles". He thinks the past is cooler than the future, and had a whole argument about it with Potty in the episode Ugh!. It is unknown if he has ever been a real pirate and not just a guy living in a normal neighborhood. He also has an elderly neighbor named Mrs. Johnson who always gives out cookies. It is shown in the episode Friend or Foe? when he was upset at Potty, that he knew Potty ever since he was a little boy, and Potty was just an egg. Patchy wears a black pirate hat with a skull and crossbones on it, a red and white bandana, an eye patch (hence the name "Patchy"), a long black beard, a purple robe, a white shirt, a hook on his hand, a peg leg for one leg, and black boots for the other leg. It appears to be missing some flesh. Sometimes Potty teases at Patchy for losing his leg, arm, eye, and the SpongeBob episode The Sponge Who Could Fly. He also appears on the Nickelodeon's Big Time Rush special,"Big Time Beach Party" where he helps Logan and Carlos find a lost family treasure of his so they can buy a beach house. Sandy tells SpongeBob about christmas customs, now he teaches the town of Bikini Bottom about Christmas. When Santa doesn't come, the citizens shun him and Squidward makes fun of him, but he make a gift for him. Now it's up to Squidward to change everything. 51 Party Pooper Pants SpongeBob decide that he will have a party at his house and he invites everybody. SpongeBob keeps bothering everybody with his list of what to do at what time list and gets locked out of his own house. 54 UGH The episode beging with Patchy the Pirate telling you that B.C times were the best. Then it tells you the story of the B.C SpongeBob, SpongeGar, Patar, and Squog discover fire. 59 The Sponge Who Could Fly SpongeBob tries to gain the ability to happily soar in the sky so he can fly with the jellyfish, but everybody laughs at him because his FIRST try was unsuccessful. 63 Have You Seen This Snail? Gary runs away when SpongeBob forgets to feed him. Does someone else take care of him? Everything that was supposed to go well on SpongeBob's Best Day Ever, doesn't. 81 Friend or Foe? The history behind the relationship between Mr. Krabs and Plankton is revealed. 92 Atlantis SquarePantis SpongeBob ventures to Atlantis and meets Lord Royal Highness (David Bowie). 96 Pest of the West SpongeBob finds out that he is related to a western hero named SpongeBuck. 98 What Ever Happened to SpongeBob? After everyone calls him Idiot Boy, SpongeBob leaves Bikini Bottom and develops Amnesia. Will Someone ever find SpongeBob? 124 Truth or Square The Krusty Krab celebrates its 117th anniversary, and Mr. Krabs plans to sell lots of Krabby Patties. But then, SpongeBob, Patrick, Squidward and Mr. Krabs get locked in the freezer. Mr. Lawrence SpongeBob tries to spread Christmas joy, but it gets hard when Plankton turns everyone into jerks with his Jerktonium-laced fruitcake. 215 Feral Friends October 7, 2017 Mr. Lawrence A weird moon turns everyone in the city into wild animals, and Sandy is the only one who can save them. In the episode Friend or Foe?, Patchy worked at a restaurant called "The Poop Deck", along with Potty. His boss was a cranky old pirate named Mr. Pirateson. All his food tasted horrible, so Patchy was fired and replaced by a gorilla. He wanted to take the job to make hamburgers just like SpongeBob SquarePants, our hero. The Poop Deck's boss named Mr. Pirateson was mad at him for thinking about his wrong favorite choice of water. Patchy's famous Patties are called "Buried Treasure", (With a Creepy voice) "Walk the Plank" and "The Patchy Patty" which was a Patty with an Eye-patch, a face and a beard. He says "WHAT!? They let a Smelly Hairy Fleabag like that serve food!!?" when he saw that he was replaced by a Gorilla. Patchy the Pirate isn't smart, but somewhat he started the SpongeBob SquarePants Fan Club somehow. At the end of each episode he appears in, he has a really big mess and trouble which makes him look like how he would be able to get out of the really Bad situation. Bad things severely happen to Patchy, and he lost his hand, leg, and foot, and eye and the SpongeBob Videotape of the Lost Episode. The reason why The Sponge Who Could Fly is called a lost episode is because it has limited broadcasting on the Nickelodeon channel each year. Patchy only appeared in 8 episodes, but he'll probably return after Atlantis SquarePantis. Note that, the broadcasting of Atlantis SquarePantis of it's first airing and other airings are different. In the first airing of Atlantis SquarePantis, Patchy does not have a major role in it. But in other airings, after and before the TV commercials of Atlantis SquarePantis' hour, he is stuck in a boat-like mobile in the middle of no where with no water, and his radio is broken. Often he breaks down into tears when Potty insults him. Because Potty is always right!!! Often he gives invitations to SpongeBob but SB can't read them! "I don't know what it means either"
"This is the end of SpongeBob! WAAAAH!!!!" "Oh go away, you stupid bird." "Get me out of here, you scurvy bird!" "Now time for the cartoon." "Oh, no! I've ruined the lost episode! Now it's lost forever!" "It's time for fan mail." "You ate all me cookie dough!" "Turn on the Weather Channel!" "Wow, Wasn't That Great Kids?" "WHAT!? They let a Smelly Hairy Fleabag like that serve food!!!?" "Well Potty I guess you were right the future is cool"
"That's it? That's the lost episode?? That was just a bunch of cheap walk cycles!" "DO YOU MIND?! I AM TRYING TO TALK TO MY PARROT!!" "Three bells! We all know what three bells means! *Kids* Free Ice cream! *Patchy* No you silly lubbers. NO!" "This letter comes to us from NAME AND ADDRESS WITHELD!" "Grrrrr... SpongeBob betrayed us?! I'm sorry I ever started this stupid fan club in the first place! I'm gonna get rid of all my SpongeBob stuff! All of it! All of it! All of it! I'm gonna run away, that's what I'll do! Run away!" Even though Patchy dislikes Potty's favorite band The Birdbrains in SpongeBob's House Party his actor Tom Kenny in fact was a good friend of the Birdbrains' leader's actor/musician Lux Interior. When Interior suddenly died in 2009 Tom Kenny attended his memorial/funeral. Patchy as a boy already had a beard as seen on episode Friend or Foe?. On episode Atlantis SquarePantis at the part where Patchy was giving his sandwich to the vulture, when he says "Come on! ", it sounds more like SpongeBob. At random times, Patchy's eyepatch switches eyes and his hook switches hands. In Friend or Foe? Patchy's hook switches from his Spatula to his Hook. This page was last modified on 8 March 2019, at 15:03. This page has been accessed 71,367 times.